The funky car Honda Brio is in the limelight not only for its urbane looks and design but also for the sale boost it has given to the Honda India cars. Honda has been a major player in the sedan market but couldn’t get a sales boost after the launch of Honda Jazz, but Brio seems to be filling up all the voids. The Honda car makers have been known for quality products which have always lived up to the expectations of the car buyers. To liven up the catalogue Honda Brio is a sporty hatch back and is already giving tough competition to the major players in the largest passenger car market. The testing of the small car waters in been done already with Jazz which did not go well with the sales but Brio is all together a new story. The claim to fame is its futuristic design and intelligently used space for its a compact car with a difference. The much talked about all glass rear of the car is already making buzz in the market and that is not the only thing which makes it a handsome car. it has all the brawn and yet it is cute in a different way. Honda has evidently put a very clever price tag and the cost cutting doesn’t seem to affect the overall premiumness of the car. The base variant of petrol Honda Brio E MT is power packed and funky. The Honda has revamped its line up with this new baby on the block which has already got car enthusiasts singing praises and has given something to write about to the famed car critiques. Brio is a true Honda car in every sense possible whether its the design or the technology. The car has a touch of elegance in every step of its design and that is what makes it different from other hatches in the market. The aggressive look with understated crisp lines makes it look young and fresh. The car has unique front lip with not a very wide grille. The H logo sits proudly at the centre and front fascia gives way to elegant shoulders which are uncluttered to give the car a bigger look. This B segment hatchback is unique in its style with body coloured rear view mirrors and handles. The chrome grille further enhances the appeal of the car in front. The car gets a thumbs up for its all glass rear which is different than most of the cars available on Indian roads. 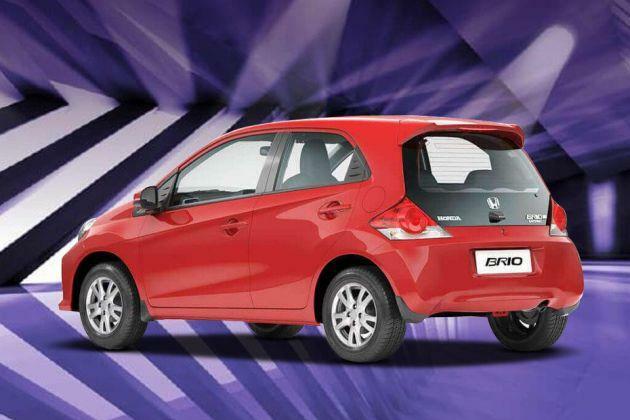 The rear is eye catching and that is what makes Brio a head turner. The construction and make of the car is on the Hondas standard G force control technology. This technology provides sturdiness and strength to the overall frame of the car. The wide wheel base has been well used and the car has a definite elite feel to it with a very comfortable price. The car 3610mm in length and 1680mm in width and stands tall at 1500mm. The car has a ground clearance of 165mm which is much better than the concept car which was first released by the Honda. the Honda Brio E MT comes in a very vibrant colour palette to choose from viz. Alabaster Silver, Rallye Red, Emerald Blue, Titanium Grey Pearl, Tafeta White and last is Crystal Black Pearl. One thing which is striking about the cars interiors is its cabin space. The car has been cleverly designed to give it a roomy feel on the inside. The impact absorbing smart yet thin seats are definitely an intelligent thought which gives car more leg room space. The car has ergonomically designed interiors and the lighter use of fabrics and glassy rear gives it an airy and well lit appeal. The dashboard sits well with the overall look of the car and has clean and uncluttered look to it. Double coloured upholstery is smart yet chic. 2 DIN audio player is prominent on the central console and takes most of the space. The knick knacks have been added to be used as storage and carrying space. The glove box is spacious and the plastic used in the interior is up market which doesn’t let the interior overall look fail. The engine of the Honda Brio E MT is SOHC i-VTEC 1.2 litre engine with 5 speed manual transmission and the displacement of 1198 cc with maximum power of 86bhp at 6000rpm and churns out a nice and easy maximum torque of 109Nm at 4600rpm. The car gives a zippy 100 kmph in mere 16 seconds and has a top speed of 185kmph . The car is economic with mileage of 18.2kmpl which is easy on pocket. The car sports disc brakes in front and standard drum brakes in the rear. The car has power steering with collapsible steering column. The car is light in weight which acts as an advantage ad car glides freely on roads and is butter smooth on sharp turns. The car easily absorbs bumps on pothole infested road and glides with easy in heavy traffic as well as off road terrain. The car has sturdy design which holds strong in case of collision with G Force Control technology which ensures good use of steel in the sensitive areas besides the glass fitted in the rear which is high strength. The other customary features are child locks and central locking with door ajar warning and engine check warning. The car with its plush interiors has a luxurious feel to its economical interiors. With seat lumbar support and technosavvy features in its tow the car is a perfect blend of youthful styling and plush comfort. The car gives a happy driving experience and a high class ride quality to its passengers. The unique styling and roomy interiors with signature all glass rear is what makes the car different from others in its league. With brand value and smart price tag this car is definitely an owners pride. The car misses ABS and air bags which is a negative point of this car.